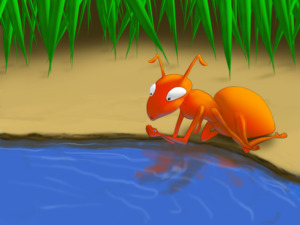 One day an ant stopped at a river bank to drink some water. He got too close. The river swept him in. 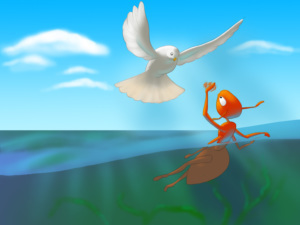 He was about to drown, when a dove spotted him. 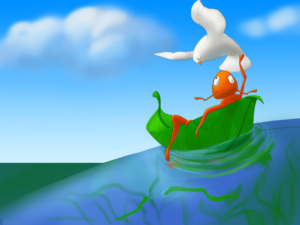 The dove tore off a leaf and dropped it into the river, right next to the ant. The ant climbed onto the leaf and survived. “Thank you, dove! I will always remember what you did for me,” he said. 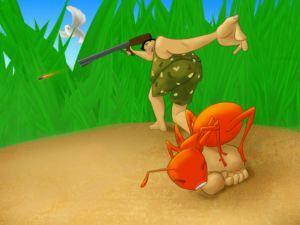 One day the ant saw a man. 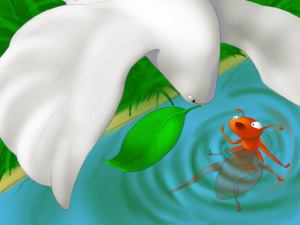 He was pointing his gun at the dove,who had saved the ant’s life. 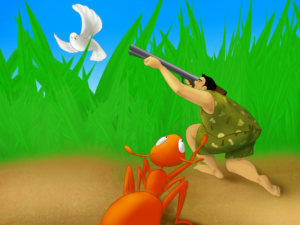 The man was going to pull the trigger and the ant racked his brains to think of something to save the bird. At the very last moment the ant had an idea. He bit the man’s leg. “Ouch!” the man yelled and missed the dove. 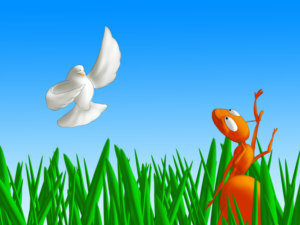 The dove flew off and waved a “thank you” to the ant for saving his life. One good turn deserves another.